Here’s a little video I made for my new YouTube channel KitchnFlix – pop over and visit – two videos so far – how to truss and then how to rotisserie a turkey. Please like and subscribe! I’m telling you – this is THE way to cook your Thanksgiving dinner tomorrow. For that matter, you can use these techniques for any bird, any time of the year! It harks back to the way the pilgrims would have roasted their birds for that first Thanksgiving over an open flame on a spit. The resulting meat is juicy and delicious. I didn’t brine my bird – I don’t think it needs this – but if you are a follower of this regime go ahead! I am so thankful for my outdoor kitchen – it’s beyond beautiful – thanks to Toby and his team. I’m also so excited to have finally fired up the DCS grill – this is one very lucky Girl and Grill! 1 organic turkey – I used a 12lb bird – the DCS grill can hold up to 50lbs on the rotisserie but for my first attempt I thought I’d play it safe. Truss the turkey – following the instructions from No Fuss Truss. Place the lemon on the rotisserie rod to mark the center and then put the turkey onto the rod – being careful not to hit bones jam the bird onto the spikes at one end. Stuff the cavity with thyme and then insert the other end of the securing spikes, making sure the bird is really well secured. Rub the turkey with salt and olive oil. Place on the rotisserie, check it is free to rotate. Light the rotisserie grill, switch on the spit motor and close the lid. Make the basting butter with some roughly chopped rosemary, thyme and garlic and a stick of butter. Melt the butter over medium heat and cook for about 5 minutes to infuse the flavors. Make a basting brush using a bunch of thyme, the handle of a wooden spoon and some butchers twine. Periodically check the bird, giving it a good baste with the melted butter using the basting brush. After a couple of hours check the temperature of the thickest part of the thigh with a meat thermometer. When the internal temperature reaches 180 F it is cooked. 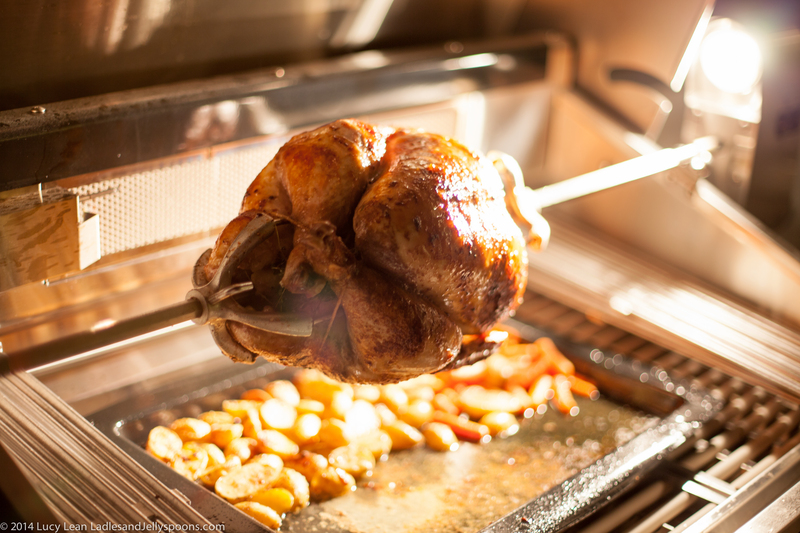 Remove from the rotisserie onto a plate. Be careful because the metal rod and the spike are very hot. Cover the turkey with foil and let rest for about 15 minutes before carving.